Soooo, Wednesday is Valentine's Day! Excited? Sad? Don't care? I have to admit that I fall into the "don't care" category. At least this year, I don't have to worry about a million valentine's for all class members of my kids because they are doing a winter carnival for the entire school day on Wednesday. I can totally get down with that. Anyone else dread the multitude of valentine's necessary for every peer in your kids class? Anyway, to not be a total grinch, I decided to make some sugar cookies with the kids this weekend. 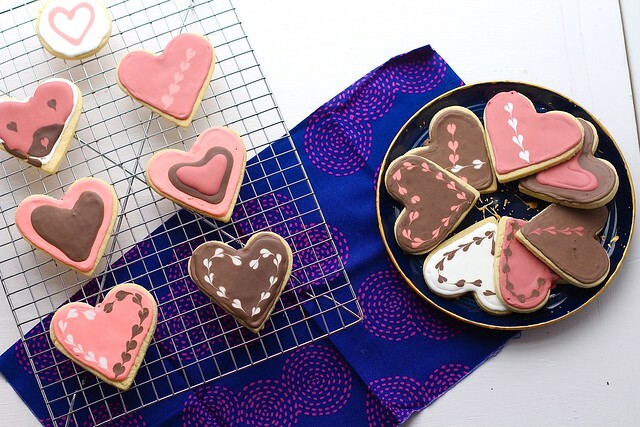 Last week, I had the thought of trying to make my own type of less sweet cookie that is fast and easy, and then top them with chocolate royal icing? I don't know about you, but I don't think I have ever come across chocolate royal icing. So, I thought it was time to remedy that. Obviously you can't turn it into pretty colors, so I separated the icing and did a couple of different colors and one bowl of chocolate. The chocolate icing was perfection. Well folks, here is the easiest sugar cookie ever. That's right, I will be so bold as to say ever. No refrigeration required, the cookie isn't overly sweet, but with royal icing on the top, it's the perfect balance. The dough is really easy to work with, not crumbly at all, and the cookies don't spread when baked. I mean seriously, how could it get any better? If you don't have a vanilla bean, it's okay. I know they are a high commodity right now since there was a world-wide bad harvest. Now, if you aren't into royal icing, or don't want to take the time, you can make your own frosting. Although, I would recommend at least attempting the chocolate royal icing, it is a fun and easy icing for kids to decorate with. And it's kind of therapeutic in some ways. I am a terrible decorater, it's just not my thing, but I still enjoy doing it. If you follow my Instagram account, you'll see my kids decorating the cookies over the weekend. My oldest just learned how to make the hearts in the cookie icing, and so she was super excited to try it out. She insisted on her best cookie being in the picture. (Her's is top left with the opposite heart colors.) 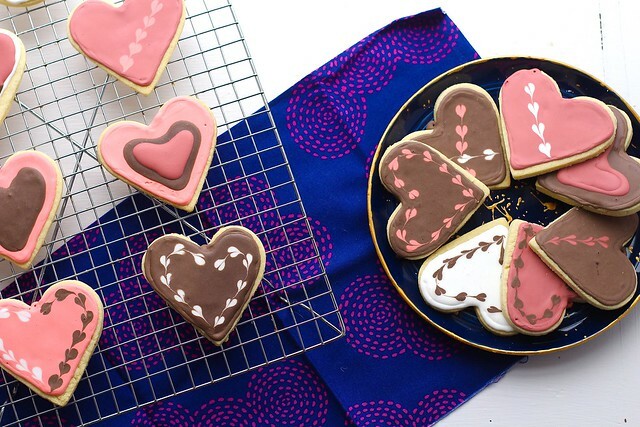 Try these cookies out for valentine's day this year, (or any time of the year, really). They are now my go-to sugar cookie recipe. Yield: depends on what size cookie cutter you use, but with medium size, at least 2 dozen. To make the sugar cookies, preheat the oven to 350ºF. Have ready multiple baking sheets lined with parchment paper or silicon baking mats. In the bowl of a stand mixer fitted with the paddle attachment, cream together the butter, sugar and seeds scraped from the vanilla bean, until light and fluffy, about 3-4 minutes on medium-high speed. With the mixer on low speed, blend in the egg and vanilla extract until combined. Meanwhile, in a separate bowl, whisk together the flour, baking powder and salt. With the mixer on low speed, slowly mix in the flour until completely combined. Then, turn the mixer up to medium-high speed and mix until the dough is no longer crumbly, about another 2 minutes. Turn the dough out onto a lightly floured surface. Roll to about 1/4-inch thick. 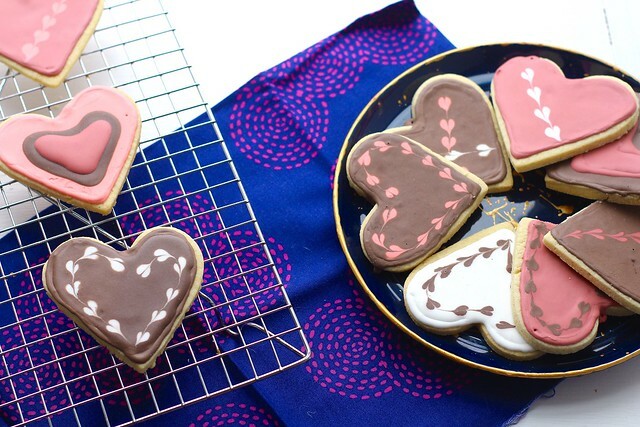 Cut out with desired cookie cutters. Place the cookies on the prepared baking sheets. Place in the oven and bake for 9-12 minutes, or until just barely firm to the touch in the center. Let cool completely before frosting. To make the royal icing, place all the ingredients (starting with 2 tablespoons cocoa powder)* in the bowl of a stand mixer fitted with the paddle attachment. Beat on high speed until the icing has a matte appearance, about 5-8 minutes. Remove the bowl from the stand mixer and stir in 1 tablespoon of water at a time with a spatula until the icing is appropriate for piping. (When the icing is drizzled over itself, the icing smooths out quickly.) Put the royal icing into piping bags, plastic bags with the corner cut out or clear plastic condiment containers. Make sure the icing stays in a sealed container, because it will dry out otherwise. Decorate as desired, and let the cookies sit out overnight to allow the icing to harden completely. Store, covered at room temperature. *If you don't want all your icing to be chocolate, don't add the cocoa powder in the beginning. Instead, separate your icing into desired amount of bowls (if you plan on adding color), whisk in 2 tablespoons cocoa powder in separate bowl of frosting when thinning with water. Taste and add more if desired.